There are several different kinds of stone are commonly used for home countertops in homes including soapstone, granite, marble and slate. While it can be tempting to purchase fancy and expensive stone cleaning solvents for the countertops in the house, the truth is that you can use items that are found in almost any home kitchen to remove stains and spills. Vinegar, baking soda and mild liquid soap are all popular and work extremely well. Create a poultice by combining water or vinegar with bicarbonate of soda and smear over the stain. Let it sit until dry and then use a soft cloth or sponge to remove the poultice. This will grab the stain material from the spot and leave it clean. Some heavy stains will require you to repeat the process several times. If you are attempting to remove stains made by organic material such as wine, milk or juice , soak a paper towel or cloth in hydrogen peroxide and lay it over the stain. Next, lay a brick or heavy paper weight on top of the compress to make sure the stain is completely covered and touching the compress. Let it stand for 4-6 hours while compressed. Once the compress has been sat for the needed time, recome the compress and wipe with a sponge or cloth. The stain should be gone. 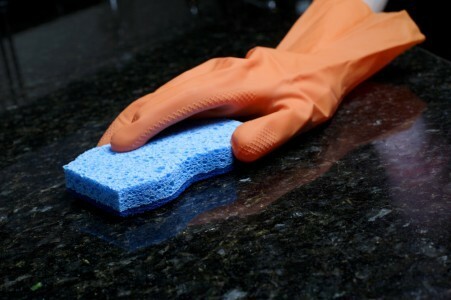 To avoid staining and discoloration to stone countertops, do not use cleansers or solvents that have a high acidic base. It is also recommended that you avoid cleaners that are or which are abrasive in nature. Avoid cleaners that contain bleach because they can cause discoloration and destroy the polish. Granite countertop Warehouse has a safe and effective alternative granite and stone cleaner available called 113m. This cleaner is perfect for everyday use, 113M is formulated to keep natural and engineered stone surfaces, such as granite, marble, quartz, limestone, travertine, Corian®, Silestone®, ceramic and porcelain sparkling clean and looking brand new.